In the world of fishing, you sometimes come across pieces of news that are funny, interesting, or just downright bizarre. WFN has compiled these stories, videos, and various pieces of miscellanea into a new regular feature: WFN's Random Catches. Step up, throw your line in, and see what you can find! What we have here is footage of a black-marble jawfish mimicking a mimic octopus. This particular species of octopus is known for its ability to mimic fish and other forms of aquatic life. So, essentially, the mimicker is being mimicked by the creature that it is usually mimicking. Talk about a head scratcher! This one is for the ice fishers out there – and, heck, for anyone who enjoys a really cool video. These scuba divers are walking on the underside of the ice that covers Finland’s Lake Saarijarvi. It creates a very disorienting effect – almost dreamlike, especially with the addition of the music. Koi, those colorful fish that you’ll find in private ponds, are beautiful, graceful fish. And, if you happen to have nine of them stolen from your backyard pond, it would be very upsetting. These fish are worth over $2,000, making them very valuable - and yet, this lady is only offering a $200 reward? Talk about a lowball! AND, to top it all off, she gives the fish names such as Big Momma, Patches, Skeletor, and Whitey? What can really be said about that? An auction at a Japanese fish market was the site of perhaps one of the most absurd purchases you’ll ever see. Kiyoshi Kimura, the president of a company that runs one of Japan’s most popular sushi chains, paid the equivalent of $736,000 for a single bluefin tuna. 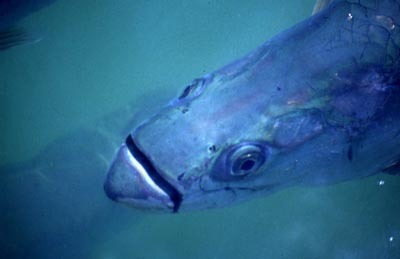 If sold at cost, this tuna will cost $96 PER PIECE when it’s eventually sold in restaurants. Hey, if the money is burning a hole in your pocket, there's probably worse things that you could spend $736,000 on. But that doesn't make it any less ridiculous! WFN's Florida Expert Mike Holliday recently posted a photo album filled with great photos, including the above one of a tarpon that looks slightly out-of-this-world. 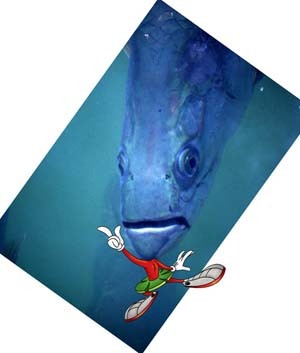 With the original image, turning it sideways will make the fish resemble an alien. So, we here at WFN decided to have a little fun with it using the magic of Photoshop.